The Internet and fan fiction – stories written by fans of a given source material – go together like peanut butter and jelly. Until now, however, it has been a gray area of potential legal headaches for the authors of the work. While they could publish pretty much any work their heart desired on sites such as FanFiction.net, there was no legal way they could make money from their endeavors as they were operating without a license. Amazon is aiming to change all of that with the announcement this morning of Kindle Worlds. Kindle Worlds is a new publishing arm for Amazon that will acquire licenses from property holders and then allow fan fiction authors to publish and sell their works based on those properties. For works of at least 10,000 words the authors will earn 35 percent of the sale price, and works between 5,000 and 10,000 words they will earn 20 percent. To kick off the new project, Amazon has reached an agreement with Alloy Entertainment for licenses on the books and television series of Gossip Girl, Pretty Little Liars and The Vampire Diaries with more properties to be announced in the future. At the launch of Kindle Worlds there will be 50 commissioned works from authors such as New York Times best-selling author Barbara Freethy, Bram Stoker Award-winner John Everson and RITA Award-winner Colleen Thompson. After the initial launch the platform will be open to submissions from anyone. Fan fiction has had a difficult time being taken seriously as the number of poor works around the Internet certainly outnumber the quality ones. Despite success stories such as the Fifty Shades series by E.L. James – it started life as a fan fiction series based on the Twilight books – it is not a concept that has received a very warm reception outside of certain circles. With writers receiving more than praise from fans of their work, and a real world incentive to produce the best work possible, all of that could change. We will also give the World Licensor a license to use your new elements and incorporate them into other works without further compensation to you. In short, if you come up a great idea, it could very well end up in the source material without you being asked. This is definitely something you want to be cautious of if you're an author thinking of using this platform. One lingering question from this project, however, is if the studios that license the properties will continue to allow fans to publish their works for free around the Web. In theory not much should change, but there is now a financial stake in this sub-section of fandom where companies can earn money from the work of others, so there might be an incentive to drive people towards the pay version of fan fiction. We reached out to Warner Bros., the parent company of Alloy Entertainment, for comment on the matter, but had not received a reply by publication time. SEATTLE–(BUSINESS WIRE)–May. 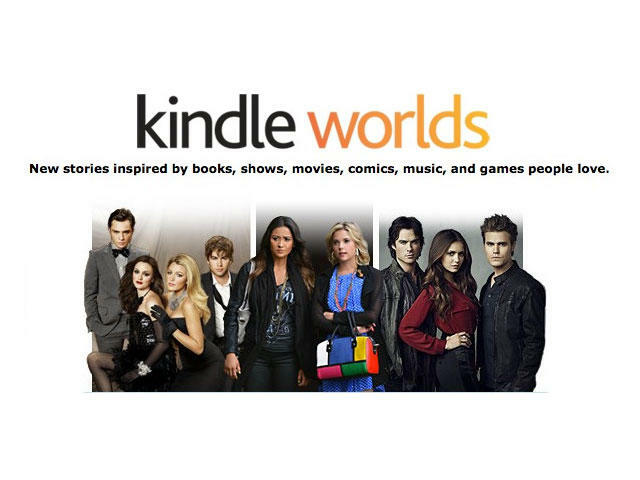 22, 2013– (NASDAQ:AMZN)—Today, Amazon Publishing announces Kindle Worlds, the first commercial publishing platform that will enable any writer to create fan fiction based on a range of original stories and characters and earn royalties for doing so. Amazon Publishing has secured licenses from Warner Bros. Television Group's Alloy Entertainment division for its New York Times best-selling book series Gossip Girl, by Cecily von Ziegesar; Pretty Little Liars, by Sara Shepard; and Vampire Diaries, by L.J. Smith; and plans to announce more licenses soon. Through these licenses, Kindle Worlds will allow any writer to publish authorized stories inspired by these popular Worlds and make them available for readers to purchase in the Kindle Store. Amazon Publishing will pay royalties to both the rights holders of the Worlds and the author. The standard author's royalty rate (for works of at least 10,000 words) will be 35% of net revenue. As with all titles from Amazon Publishing, Kindle Worlds will base net revenue off of sales price—rather than the lower, industry standard of wholesale price—and royalties will be paid monthly. In addition, with the launch of Kindle Worlds, Amazon Publishing will pilot an experimental new program for particularly short works—between 5,000 and 10,000 words. For these short stories—typically priced under one dollar—Amazon will pay the royalties for the World's rights holder and pay authors a digital royalty of 20%. "Our books have generated a massive amount of fan fiction, and we see this as an evolution in publishing and a valuable way of broadening our brands and engaging fans," said Leslie Morgenstein, President Alloy Entertainment. "When working with Amazon Publishing on this scale, we know we're in good hands and everyone will benefit." "Seeing Pretty Little Liars fans adapt and create their own stories is both exciting and flattering and I think what Amazon Publishing is offering through Kindle Worlds is a great way to reward their ingenuity," said Sara Shepard, author of Pretty Little Liars. "I loved writing the characters in this world, the dynamics of the friendship between the four girls as they deal with life-threatening situations," said Barbara Freethy, writing in Pretty Little Liars. "I also really enjoy the ongoing mysteries and surprising twists that always keep the reader guessing. It's great that Amazon Publishing has given those who put passion into fan fiction the opportunity to commercialize this work." "At Kindle, we're not only inventing on the hardware and software side of the business, we're inventing new ways to create books," said Philip Patrick, Director, Business Development and Publisher of Kindle Worlds. "Our goal with Kindle Worlds is to create a home for authors to build on the Worlds we license, and give readers more stories from the Worlds they enjoy. We look forward to announcing additional World licensing deals in the coming weeks."